Browse > Home / News / Malcolm hold Wentworth? Sure can! It’s that time of the year…a Federal election and the Jewish House Rosh Hashana food drive. Busy federal MP Malcolm Turnbull took valuable time out of his hectic campaign to ensure retaining the Liberal seat of Wentworth in Sydney’s Eastern Suburbs. 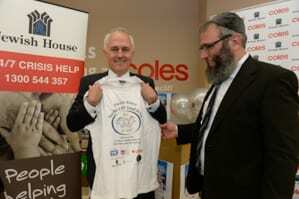 Malcolm Turnbull donates his candney’s Eastern Suburbs to lend a hand to the Jewish House’s CEO Rabbi Mendel Kastel. 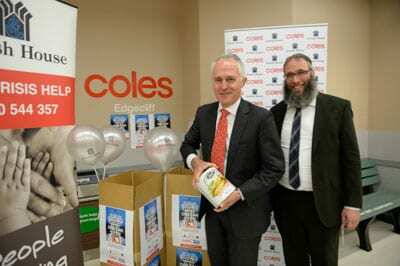 The occasion was the launch of the 2013 “Yes We Can” campaign at Coles Supermarket in the Sydney suburb of Edgecliff. Turnbull was quick to show onlookers how it is done. Buy an extra can or item of food over and above your shopping list and drop it into the tubs at the supermarket’s exit. Jewish House takes over from there. They take they food back to their HQ from which it is distributed to the needy to allow them to enjoy a full table at Rosh Hashana. For Turnbull it was back to the campaign trail clutching his “Yes We Can t-shirt”. “Can you hold Wentworth?” asked J-Wire. “Yes we can” replied Malcolm Turnbull. He’s such a gentleman on and off the media circuit and the political arena, he gave us an insight on ABC’s Annabel Crabbs Kitchen Cabinet. It’s great to have him on board supporting your efforts.